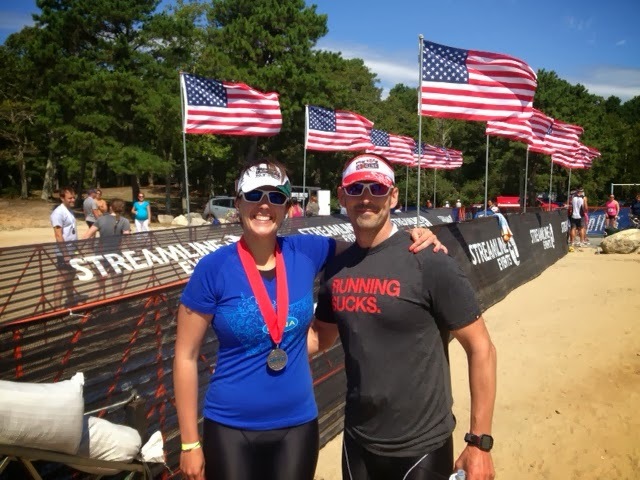 Following Timberman and OOB, D received a note from the Race Director for Streamline events asking if he wanted to do Hero's Tri. Since it wasn't the same weekend as the other events we were already registered for we figured why not. After everything that happen at Timberman it was going to be an interesting come back for D, read about it here . In order to save us a bit of time on Sunday morning we booked a close by hotel to the race on the Cape. Turned out to be a fairly decent place for the night. 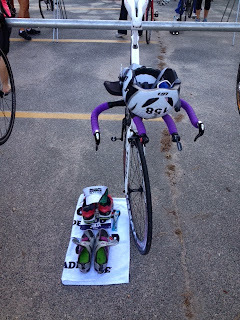 We drove in to the race location, sadly had to park a couple miles away and ride our bikes into transition. I laid out my transition surrounded by lots of newbies. I kid you not some of these layouts were for full clothing changes. Eh to each their own. I kept my spot skinny like usual. I am generally okay with whoever is around me as long as they don't creep into my space. We bumped into friends and headed down to feel the water out. It was chilly I was happy to be wearing a wetsuit. Kim told me she was going wetsuit less good for her! I am not into that anymore! 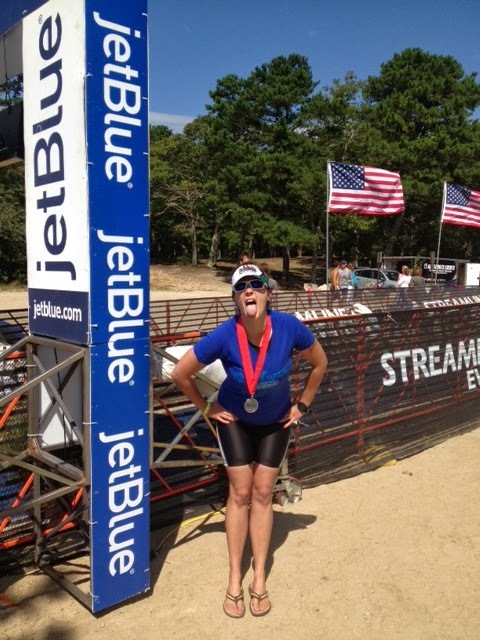 Ripped off the wetsuit and Kim didn't wear hers so she was flying through transition. I tried to get my shoes on fast and helmet. As I put the helmet on I heard a crunch in the ear piece?! OH crap lets just go it will still work. We hit the mount line at the same time and Kim told me to go she wasn't going to keep up anyway. I was like aw come on what fun is that?! 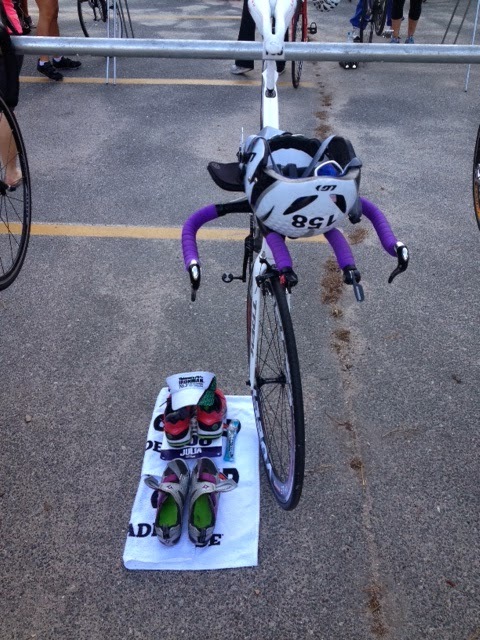 The course was a ride out to the Joint Base, a little bit of rollers to get there, and once you were there flat glory. And while you were out there almost exclusively cyclists on the road. There was little to no road traffic. It was nice to ride along side the runways. Only problem was you were exposed along those parts and there was a bid of a headwind. D came flying by on the end of the first loop. Said that I was up in front and that I needed to keep it up. I kept my head down and tried to keep pushing. You did 2 loops of the base than hit the little rollers back to transition. I came into transition to a lot of cheers from the spectators and the relay teams waiting on their team mates. Generally this is what happens when you are toward the front. Ok guess I am doin okay. My thoughts were just push as hard as you can. See what you can maintain. Don't hold back just go all out. I had a few woman get by me some I knew were on relays and others flew by me at like 7 min pace I knew I wasn't going to be able to do that. As I saw D on one of the out and back's he gestured 8th. I waved him off. He told me I better keep it up. I was able to as much as I could. As I came into the finish he was in his usual spot SCREAMING pick it up! Your out in front. Every second counts! I crossed the line as the 9th Female in the race! 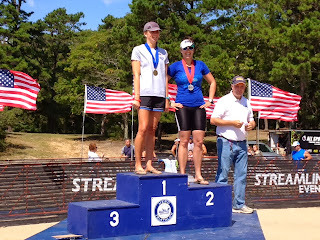 A top 10 Female finish! I took home 2nd in my Age Group! Finish time 2:24:29. I was psyched. The other great thing was when we asked a guy to take a pic of us at the finish. He admitted to me he paced his bike off me while we were out on the base riding. A guy! Not bad! I am starting to think my cycling is coming along well time to get a faster run!!! 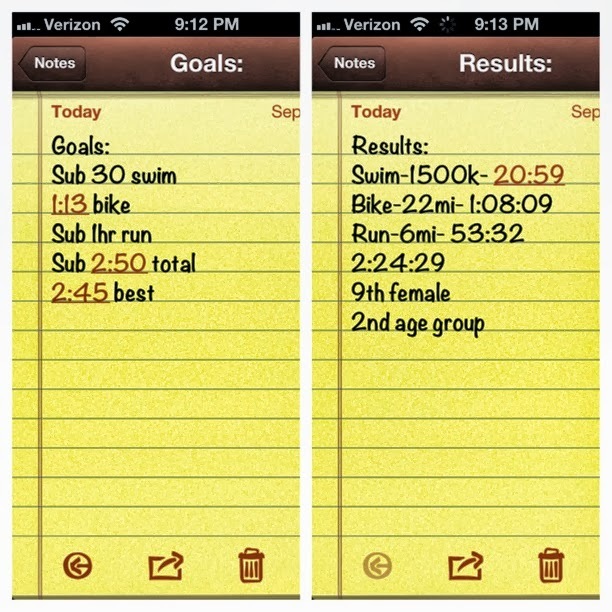 The night before I had laid out some numbers for myself in hopes that I would have some good goals for the race. 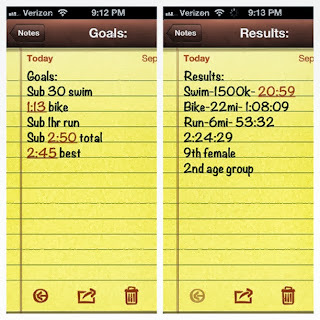 I was happy to write down the results next to the goals and see I shattered what I thought i would be able to do that day!